Ven. 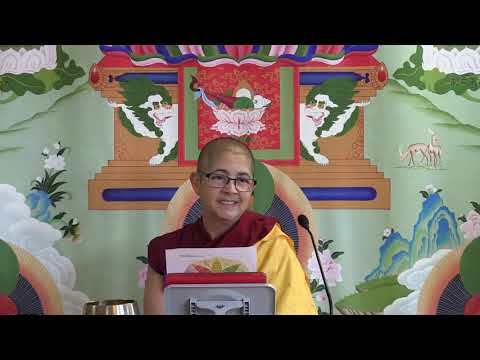 Thubten Nyima was born in Colombia and has lived in the United States for over 35 years. She became interested in Buddhism in 2001 after meeting a tour of monks from the Ganden Shartse Monastery. In 2009 she took refuge with Ven. Chodron and became a regular participant in the Exploring Monastic Life retreat. Ven. Nyima moved to the Abbey from California, in April of 2016, and took Anagarika precepts shortly thereafter. She received sramanerika and shiksamana ordination in March 2017. Ven. Nyima has a B.S. degree in Business Administration/Marketing from California State University, Sacramento and a Masters degree in Health Administration from the University of Southern California. Her career spans both private and public sectors, including 14 years of management-level work for Sacramento County’s Child Protective Services. She has a young adult daughter who lives in California. Ven. Nyima contributes to Sravasti Abbey’s administrative functions by thanking donors, helping with community planning meetings and facilitating SAFE courses. She also works on the vegetable garden and enjoys working in the forest when needed.